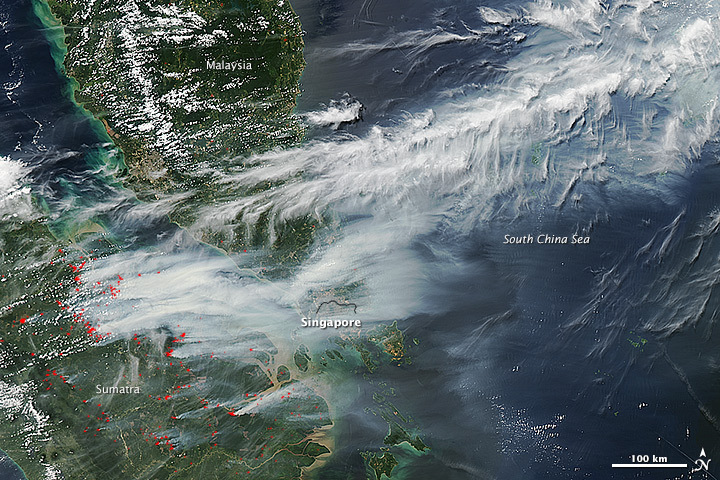 The haze from slash-and-burn fires on the Indonesian island of Sumatra has now spread to southern Thailand. Several districts in Narathiwat, Songkhla and Satun provinces were blanketed in smog this morning (Tuesday). The Thai authorities said the pollution had not yet reached a level that was harmful to public health. Much of Western Malaysia is still shrouded in haze. Pollution levels have dropped in many towns and in the capital Kuala Lumpur, but the Air Pollutant Index level today reached 484 in Port Klang and 333 in Seri Manjung, Perak state. A pollutant index reading above 300 is defined as hazardous and a sustained reading of above 400 can be life-threatening to ill and elderly people. In Sumatra, a state of emergency has been declared in the worst affected districts in Riau, where the fires are centred. According to press reports, more than a thousand people had to flee two villages in the province today when thick smoke made it too difficult to breathe. Schools remained closed in many Malaysian states today. Residents of Johor state were relieved to see rain arrive. The pollution level in Muar went down to 132 today. This is still considered unhealthy, but is far from the highly dangerous level of 746 that was reached on Saturday. Saturday’s peak was the highest air pollution level recorded in Malaysia in 16 years, and states of emergency were declared in Muar and nearby Ledang. In Singapore, pollution levels remained at “moderate” today. Last Friday, the Pollutant Standards Index hit 401 – the highest in the country’s history. Greenpeace International has called on palm oil and pulp and paper companies in Indonesia “to accept responsibility for their role in the country’s forest fires rather than hiding behind zero-burn policies or trying to imply that local communities are to blame”. 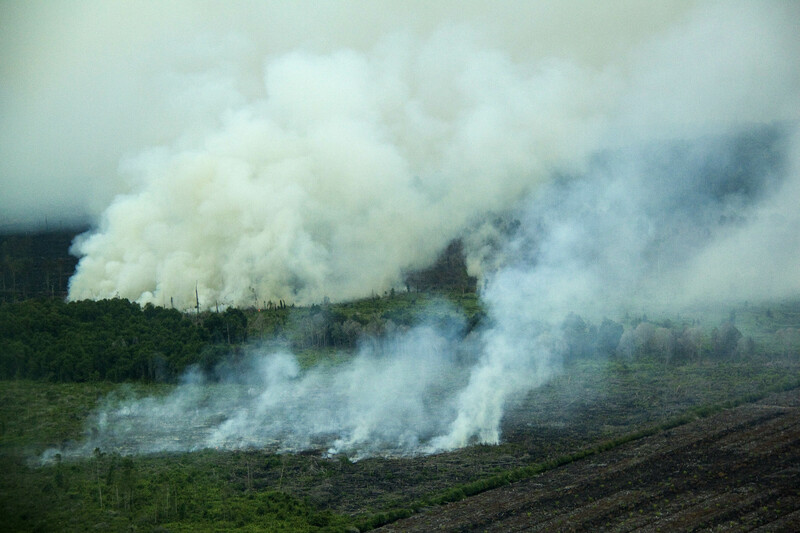 Palm oil and pulp and paper companies have rejected accusations that they are responsible for fires in or around their concessions in Riau province, but Greenpeace International says the current problems are the result of decades of forest destruction in Sumatra. “Palm oil giants such as Sime Darby and Wilmar International can’t just wash their hands of responsibility for these crimes and hide behind their zero-burning policies,” said Bustar Maitar, head of the Indonesia Forest Campaign at Greenpeace International. The US-based World Resources Institute said initial data showed that half of the fires are burning on timber and oil palm plantations. “Most of the NASA fire alerts are located within the province of Riau, and chiefly within the boundaries of timber plantation and oil palm concessions. About 52 percent of the total fires occur within these concession areas. WRI noted 33 fire alerts in the palm oil concession of PT Jatim Jaya Perkasa, which is affiliated to Wilmar International. The Singapore-based fibre, pulp and paper manufacturer Asia Pacific Resources International (APRIL) and Indonesia-based Asia Pulp and Paper are other multinationals that have been accused of having fires in their concessions. APRIL said that all the fires it had detected started outside of its concession areas and spread into its concessions. APP said it was fighting to extinguish fires in its suppliers’ concessions and did not practice, and condemned slash-and-burn clearance. Malaysia-based Sime Darby says TMP is unable to exert control over activities beyond its operating areas and where land is occupied by others. 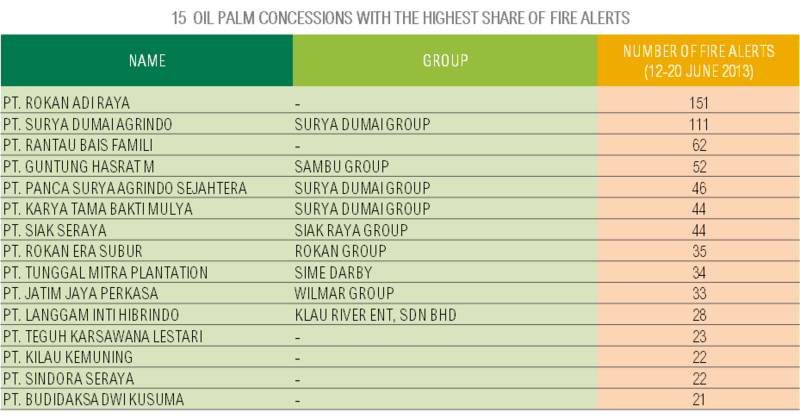 It says 2,474 hectares of TMP’s 13,836-hectare concession are occupied by local communities. 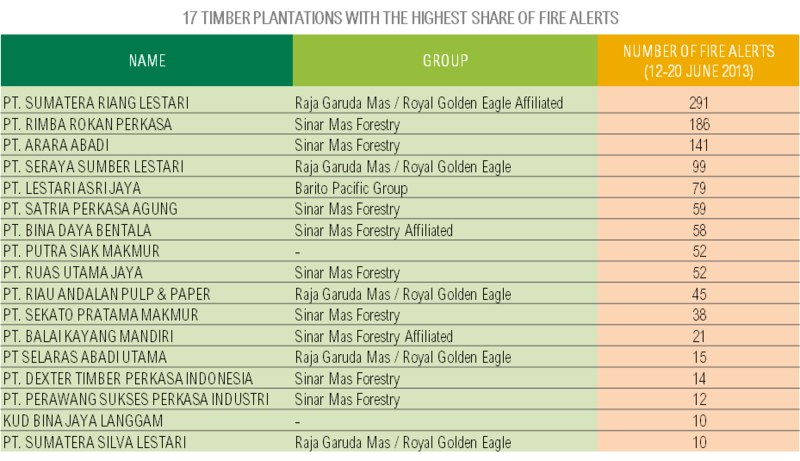 PT Tunggal Mitra Plantation is one of the eight companies cited by Indonesia’s environment minister, Balthasar Kambuaya, as being suspected of causing the fires in Riau; the others are PT Multi Gambut Industri, PT Udaya Loh Dinawi, PT Adei Plantation, PT Jatim Jaya Perkasa, PT Mustika Agro Lestari, PT Bumi Reksa Sejati, and PT Laggam Inti Hibrindo. It’s currently estimated that about 2,000 hectares have been burned. Indonesian authorities are reported to have arrested eight farmers for setting illegal fires. Indonesians on Sumatra have suffered the pollution from the annual slash-and-burn clearance for years, and no concrete action has been taken to remedy the situation. Again this year, local people are choking under the haze and having to seek medical treatment for all manner of haze-related ailments. 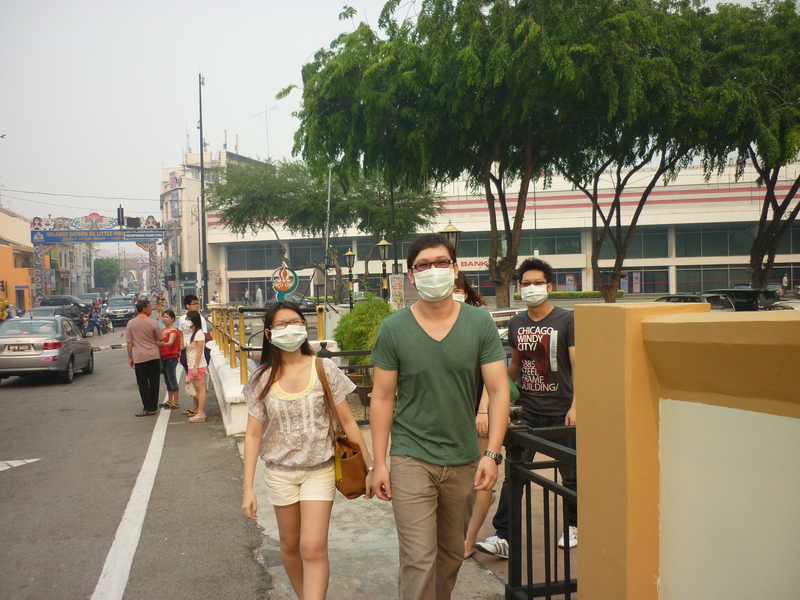 Malaysians are also reporting breathing problems, headaches, eye problems, and skin rashes. Indonesian fire-fighters are overwhelmed with the task they face and have been battling the blazes for two weeks. Fires on peatland are notoriously difficult to extinguish, and it can take hours to put out a blaze on just one hectare of land. Malaysians and Singaporeans are tired of the annual smog. One Johor resident wrote to the New Straits Times newspaper to say: “It is agony for those with respiratory problems such as asthma. As I spend another day in the choking haze in Johor Baru, I am distressed by the apparent lack of action to address the problem at its source. “The illegal burning of forests and farmland in Sumatra is an annual affair that has caused immeasurable suffering to neighbouring countries. “Our natural resources and environment minister should engage with his Indonesian counterpart to register the peoples’ concern and urge for proactive measures to stop the illegal burning. Relations between Indonesia and its neighbours are fraught over the issue. The comments of one Indonesian minister, who called the Singaporeans childish for being upset about the haze, were tactless to say the least. Yesterday, the Indonesian president Susilo Bambang Yudhoyono apologised to Malaysians and Singaporeans for the haze and said his country was fully responsible for overcoming the problem. Indonesia, however, is the only member of the Association of Southeast Asian Nations (ASEAN) that has not ratified the ASEAN Agreement on Transboundary Haze Pollution, signed in 2002. Palm oil and timber companies in Indonesia are notorious for burning large swathes of land to clear them for plantations. Corruption is rife. “The lack of government transparency makes it very hard for independent monitoring; concession maps are incomplete, data is lacking, and we clearly have weak enforcement of laws,” said Greenpeace Southeast Asia forest campaigner, Yuyun Indradi. At least 2,800 hectares of the environmentally precious Tripa peat forest in northern Sumatra were devastated by fires in March 2012, and most of the hotspots occurred on the deepest peat. The illegal burning is being carried out in an area that should be off-limits for conversion as it lies within the Leuser Ecosystem. The area is home to the highest-density population of Sumatran orangutans in the world, but it is estimated that at least one hundred of them have perished in forest clearing and peat burning. Efforts to stop the destruction of Tripa are being continually blocked by legal wranglings.